Welcome to the fourth installment of What We Took Out From the Library Last Week, the newest chapter in a weekly series where we take a look at the FIVE books my five-year-old daughter checked out at our local library last week. I’m listing the books in the order they were selected and this fourth book definitely falls into the category of “old favorite.” Every time we hit the library, we end up coming home with, at least, one book that we’ve checked out multiple times before. 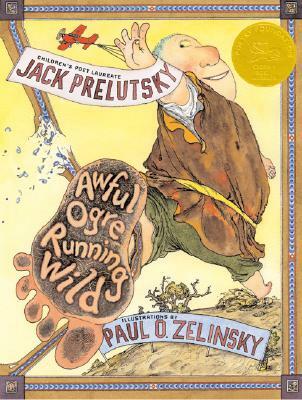 My daughter loves to re-read books that connected with her in the past and so, when she saw Awful Ogre Running Wild by Jack Prelutsky and Paul O. Zelinsky sitting on the “Librarian’s Picks” shelf last week, I KNEW we were coming home with it. I know some parents are hesitant about reading poetry to their children. I don’t know why. Maybe it’s because “poetry” is a loaded word for certain people. Maybe, to them, “poetry” conjures images of Sylvia Path, Emily Dickinson, beatniks, hipsters, and holier-than-thou coffee shop readings, and they just can’t get past that. While a part of me sympathizes with that prejudice, the vast majority of me just wants to slap them. Parents, perhaps without them even realizing it, read poetry to their kids ALL THE TIME, whether they’re singing a nursery rhyme or reading Dr. Seuss aloud. In fact, a huge percentage of picture books are actually poetry books – they’re narrative poems with rhyme, meter, etc. – but I guess those parents just see the images as the focus point. Who knows? But one of the many reasons that I’m so fond of Awful Ogre Running Wild is that it’s a picture book that REVELS in its poetry. It’s a book that proudly classifies itself as a poetry book and announces on its cover that its author, Jack Prelutsky, is the Children’s Poet Laureate. (Ooh la la.) 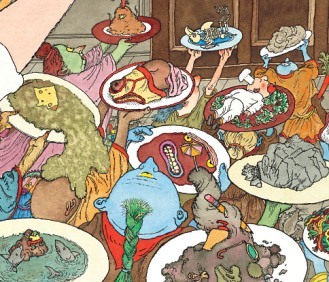 And, in cooperation with renowned illustrator Paul O. Zelinsky, Prelutsky has created one of the most kid-friendly poetry collections ever, a book that wonderfully taps into the Id of children everywhere and turns all things gross and boorish into something beautiful. The book introduces us to Awful Ogre, a giant immature cyclops who smashes and destroys everything in sight. (Awful Ogre actually first appears in Prelutsky and Zelinsky’s Awful Ogre’s Awful Day, but… though I’m ashamed to admit it… our library doesn’t have it.) And Awful Ogre – he’s rude, he’s dirty, he’s destructive, and… he looks like he’s having a great time. Zelinsky does a really amazing job of making Awful Ogre into something distinctly monstrous, but in a really lovely, charming way. He’s a brute, but he’s a loveable brute. In the world that Prelutsky and Zelinsky create, the people that have to interact with Awful Ogre recoil at the very sight of him, but, as readers, the authors make it tremendously fun to watch the Ogre’s oblivious, joyful destruction from a distance. I chop a bit of floor. And I thought I’d celebrate. As the poems progress, we learn a lot about Awful Ogre’s routines. He exercises, he makes some toast (with the help of a dragon), he paints a picture (of rats), he enters a cook-off (he wins for his cactus bat brochette) – it’s great fun to watch someone be so optimistic and happy about things that are so over-the-top odd and gross. My daughter CACKLES when we read Awful Ogre Running Wild. There’s just something about watching such antisocial behavior unfold, but in a way that isn’t mean or cynical or hurtful. I think kids are just amazed when they see someone who likes to flaunt the fact that they reject the status quo. You know, the kind of person who actually likes it when they’re called “weird.” That’s strangely attractive to kids and Awful Ogre Running Wild just takes that idea and runs with it all the way home. 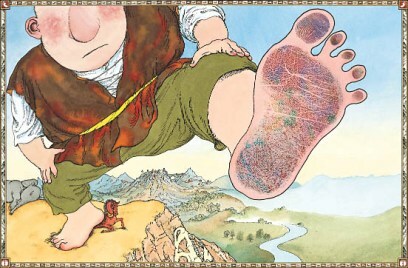 For any parent who’s iffy on reading poetry to their kid, I challenge you to read Awful Ogre Running Wild. Trust me, not once will you feel like an anemic English major or a tortured scribbler of free verse. You’ll just marvel at an author using some simple, evocative language to turn something really ugly into something really beautiful… and funny too. Your kid will love it. I think my girls would love this book. They love poems and anything gross. Thanks for sharing.